Bovine herpesvirus 1 (BoHV1) is the cause of economically significant viral infections in cattle. Respiratory symptoms associated with the infection are known as Infectious Bovine Rhinotracheitis (IBR). Sheep and goats are less sensitive to the infection although their role in inter-species viral transmission under field conditions is subject to controversy. The objective of this study was to investigate seroprevalence of BoHV1 infections in cattle, sheep, and goats raised together for at least a year. Blood serum samples were taken from 226 cattle, 1.053 sheep, and 277 goats from 17 small- to medium-scale farms. BoHV1-specific antibody presence and titers were determined using virus neutralization test. In total, 73 of the 226 cattle (32.3%) were seropositive. The infection was detected in 13 of the 17 farms. Infection rates ranged from 5.8 to 88.8%. Only one of the 1053 sheep (0.09%) was seropositive. However, 58 of the 277 (20.9%) goats were seropositive. Goat samples taken from 8 of the 17 farms were seropositive with infection rates ranging from 17 to 38.9%. Statistical analysis showed a significant correlation in infection rates between cattle and goats but not sheep. These results suggest that goats may be more sensitive to the BHV1 infection than sheep and the role of goats as possible reservoirs for BoHV1 in the control and eradication of BHV1 in cattle should be considered in future studies. 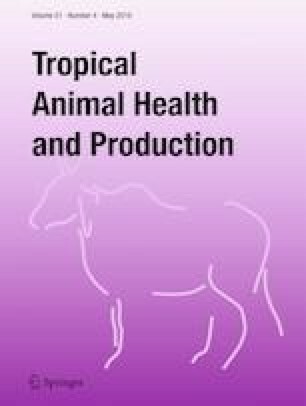 The authors appreciate the help from Veterinarians Gökçe Elveren, Ersen Şahanoğlu, and Halil İbrahim Önder in sample collection. This study received financial support from the Afyon Kocatepe University, Scientific Research Commission (Approval No. 09.VF.05/2017). The study complied with the Ethical Standard of Animal Ethics Committee of the Afyon Kocatepe University, Afyon, Turkey.